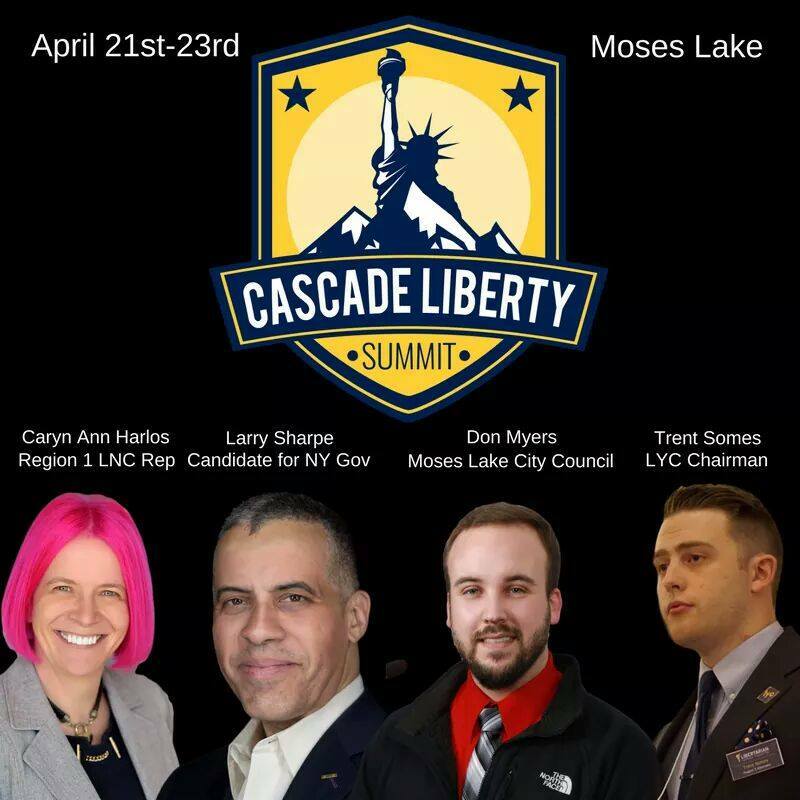 The 2017 Libertarian Party of Washington State Convention was held in Moses Lake, WA from April 21st to 23rd, 2017. LCI was on-site for the Friday and Saturday festivities. Training for candidates and volunteers were held on the 23rd. There was a great deal of surprise to everyone in attendance as current LPWA State Chair, David Traynor reported to the attendees that they were 3 members short of reaching quorum requirements to hold the business meeting portion on the convention. It was agreed upon by the body to host the business meeting portions of the State Convention on July 8th and possibly 9th, 2017; likely within King County to address the attendance situation. State leadership is said to have had the event in Moses Lake since City Council member, Don Myers is located there; along with the fact that Eastern Washington has held 4 of the last State Conventions and the East Side needed a turn. Despite the convenience of the location, only a small number of Eastern Washington Libertarians made the convention, primarily being an approximate 3/4 attendance from King, Snohomoish and Kitsap Counties. Libertarian Party of King County Vice Chair, Matt Dubin addressed the crowd and words of encouragement for the State Party. 2017 Kent City Council Candidate, Paul Addis addressed the convention with his own "Letter from Paul" to rally together members of the state party. 2018 Potential Governor Candidate, Larry Sharpe had informative words as well, for the Washington State Libertarian Party in his presentation. Don Myers, current Libertarian City Council member of Moses Lake, WA closed out the speaking session for that Saturday and had more words of inspiration for the LPWA body in attendance. LPWA will continue on with their business session of the convention in July 2017. Stay posted with their website at https://lpwa.org/ and their Facebook page at https://www.facebook.com/libertarianpartyofWA/. David Traynor,Matt Dubin, and Don Myers video courtesy of LCI Independent Contributor, Alex Love of Love 4 Liberty. Editing by LCI E.I.C. David Malekar. The following is information provided by Caryn Ann Harlos regarding the "Statement of Principles" (1974) and the video presentation was from the 4.22.2017 LPWA State convention. This video presentation follows along with the packet information listed below. Use the text information to follow along with Caryn Ann. We, on the contrary, deny the right of any government to do these things, and hold that where governments exist, they must not violate the rights of any individual; namely, (1) the right to life — accordingly we support prohibition of the initiation of physical force against others; (2) the right to liberty of speech and action — accordingly we oppose all attempts by government to abridge the freedom of speech and press, as well as government censorship in any form; and (3) the right to property — accordingly we oppose all government interference with private property, such as confiscation, nationalization, and eminent domain, and support the prohibition of robbery, trespass, fraud, and misrepresentation. We, the supporters of the Libertarian Party, rise to challenge the myth that government has the right to exist and act independently of its role as an agent for the protection of the individual rights of each citizen. In recognition of the nature of man, we hold as our first principles that the individual has the right to absolute dominion over and disposal of his life, in order that each may be free to attain the greatest happiness and realization of human potential possible to him. That every individual has absolute, in alienable and inseparable rights to his life, liberty, and all the products thereof, and that every individual has the right to seek and act in accordance with his proper judgment insofar so that he does not thereby violate the same rights of others. The only justification for government is to provide for the defense of these individual rights. Government has no right not possessed by its individual citizens. We further hold that it is the right of every individual to enter freely into contacts by mutual consent. The only economic political system consistent with individual rights is laissez fair capitalism under a constitutionally limited government commissioned by citizens as an agent for the protection of each individual's rights. With this as our foundation, we propose the following specific platform. This information was gathered from my transcription of a moderate quality audio file from the 1972 convention. My best attempts are made at names and faithful reproduction. Man finds himself living among men, either as a free man or a slave. Depending upon the ideas which men hold concerning man's nature, and his proper relationship to other men, and the institutions men have established, either the individual possesses the right to his own life, or he exists by permission, his life justified by the benefits that others derive from the use and disposal of his life and property. Throughout all of history the question has been who is to be sacrificed to whom accepting the premise that man is by nature a sacrificial animal. His goodness is determined by using as a moral standard the beneficiary of man's actions--if others benefitted that is good; if he benefited alone that is evil. Man is presented with a false alternative, either to sacrifice himself or his values to others, or to sacrifice others to himself. The name of this moral code is altruism. It is the moral system which is dominant in this nation today. Men who hold altruistic premises are willing to give their moral approval to laws which permit the sacrifice of some men's values for the benefit of others in the name of the public interest. It is altruism which has brought this society to its knees Unless it is challenged, altruistic premises shall be implemented to a greater extent leading inexorably to a totalitarian state in which all men will exist as right-less creatures at the mercy of those who enforce the laws. The principles of the altruist ideology are incompatible with the requirements of man's life. The members of the Libertarian Party are individuals who share certain principles and premises regarding man's nature, man's relationship to other men, and the proper functions of government which are fundamentally antithetical to the commonly held ideas and premises of altruism. We recognize that the basic natural alternative confronting man is that of life or death. All of man's actions are either pro-life or anti-life actions including the volitional actions of man's mind. Therefore, the only rational standard to use to make value judgments of man's actions is his life on earth. All pro-life actions are good and all anti-life actions are evil. By this standard, a man has a moral sanction to be free to take any action which his own life requires. The moral sanction to an action in a social context is a right. Man has no automatic conceptual knowledge of what his nature and needs are, and his life depends upon his freedom to acquire this knowledge and to act in accordance with his own judgment. Since this is true, it follows that each man has the right to interact with other men only by mutual consent and does not possess the right to start the use of physical force in any form against another man. Man is not a sacrificial animal. We hold that man has the right to act in his own self-interest and that no man can seek to benefit himself by using force against other men. No man has the right to the use or disposal of the productive effort of another man, but each man has the right to own, use, and dispose of the product of his own efforts as he sees fit in order to exercise his right to his own life. Any man who violates the rights of another sacrifices any just claim to his own rights. A truly selfish man does not seek his self-interest at the enslavement of others. There is no conflict of interest between men to recognize the inalienable right of each man to his own life and property. The only proper function of a government in a society based on these principles is the protection of the individual rights. A government may only do what it specifically delegated to do by the citizens. A citizen may not empower a government to perform an action which a citizen himself does not have a right to do. The source of man's rights is not the government, nor other men, but rather his own nature. A right can only be recognized or violated. The extent to which a government fails to recognize the rights of the citizens is the extent to which the citizens are enslaved. Our government has extended its power far beyond those we consider to be morally justifiable by our standards. It is our purpose to reverse the direction of this nation, and not to be content until we until we succeed in reducing this government to its proper function of its protection of individual rights. A society based on the concept of individual rights is capitalism, a term mistakenly applied to our present society. Capitalism is actually the only system in which the inalienable rights of an individual to life, liberty and the ownership and use of private property are recognized in principle and law in which all interactions among men are by mutual consent, including the interactions between individuals and the government, in which the initiation of physical force or fraud by individuals, groups, or government is outlawed. It is our avowed purpose to create a capitalist society because we know in reason that it is the only society in which the individual man may flourish in an atmosphere of freedom, peace, and justice. Such are our principles and goals, our fundamental convictions upon which the following Platform is based. We, the members of the Libertarian Party, aware that government at all levels has grown abusive and that political parties have refused to respect basic moral principles, are determined to offer simple and fundamental change. In place of the political system which aggresses against individuals and insists that own's life is the property of others, the Libertarian Party supports recognition of each person's right to dispose of his life as he sees fit so long as he does not violate the same right of others. The Libertarian Party defends individual sovereignty [inaudible]. Because the individual owns his life, he owns his property and may exist peacefully in whatever way he wishes. Consequently the Libertarian Party holds that the protection of private property from forcible or fraudulent seizure is the primary function of government and that laissez fair capitalism is the only moral political economic system. All other systems, from communism and fascism to welfare-state liberalism, forcibly relegate the individual and his property to be controlled by others. Today's politics are drifting into a total repudiation of individual sovereignty and private property. To those who answer the question "Who owns your life?" with "I do," the Libertarian Party offers the only alternative. We, the members of the Libertarian Party, challenge the cult of the omnipotent state, and defend the rights of individuals. We hold that each individual has the right to exercise sole dominion over his own life, and the right to live his life in whatever manner he chooses, so long as he does not forcibly interfere with the equal right of others to live their lives in whatever manner they choose. Governments throughout the world have regularly operated upon the opposite principle, that the State has the right to dispose of the lives of individuals and the fruits of their labor. Even within the United States, with a government less totalitarian than most others, all political parties other than our own grant to the government the right to regulate the life of the individual and seize the fruits of his labor without his consent. We, on the contrary, deny the right of any government to do these things, and hold that the sole function of government is the protection of the rights of individuals: namely (1) the right to life -- and accordingly we support legislation prohibiting the initiation of force against others such as killing, maiming, injuring, and all forms of physical assault on life and limb; (2) the right of liberty of speech and action -- and accordingly we oppose all attempts by government to abridge the freedom of speech and press, as well as government censorship in any form; and (3) the right to property -- and accordingly we oppose all government interference with private property, such as confiscation, nationalization, and eminent domain, and support legislation which prohibits robbery, trespass, fraud, and misrepresentation. Since government has only one legitimate function, the protection of individual rights, we oppose any encroachment by government into the areas of voluntary or contractual relations among individuals. Men should be left free by government to deal with one another as free traders on a free market; consequently, the only economic system compatible with men's rights is laissez-faire capitalism. We, the supporters of the Libertarian Party, rise to challenge the myth of the omnipotent collective, to assert and defend the sovereignty of the individual. We hold that each man has a fundamental right to his own life. This right imposes no obligation on another man except of a negative kind, to abstain from violating any other man's rights. Libertarians recognize the right of each individual to act as he, and he alone, chooses provided he does not violate the similar right of any other individual. The Libertarian disclaims any right and refuses to recognize any claim to a right by others which requires for its implementation or enforcement an unchosen obligation or involuntary servitude on any other individual. The Libertarian renounces the initiation of force to obtain his ends, he will thus not sanction the initiation of force by any individual or agent, the government included, to obtain any end. The Declaration of Independence established the principle that to secure these rights governments are instituted among men. Thus was provided the only valid justification of the government. This principle also defines our government's only proper limited purpose, to protect man's rights by protecting him from coercion. The government may not go beyond its limited purpose without violating individual rights and thus destroying liberty. Liberty can only find its fullest expression in the free market, where all exchanges of property and labor among men are voluntary. Thus, the only socio-economic system capable of expressing liberty is laissez faire capitalism. It is the only system consistent with individual rights. Rooted in the philosophies of reason, proclaiming the sanctity of individual rights, we do explicitly and proudly affirm our dedication to fight the battle for capitalism, to wage the ideological war that must be fought if liberty is to survive, to achieve that society in which all men are free to seek their chosen goals, the enumeration of the positions herein shall not be taken to disparage other positions which libertarians may share. We, the members of the Libertarian Party, rise to proclaim that man's life is an end in itself, and that the purpose of a man's life is his own happiness. We challenge the myth of the divine right of the public good. The public good means only that the good of some individuals takes precedence over the good of others. We base our political philosophy on man's nature and his relationship to [inaudible]. Man is distinguished by the possession of reason which is his basic need for survival. To the extent an individual abandons reason in favor of authority, position, or emotion, he is his own destroyer. A right is a moral sanction of an individual's freedom to act voluntarily, without coercion, for his own goals. The right to life is the source of all rights, and the right to property is its only implementation. The right to property is the right to act, not to posses an object. Individual rights are the necessary condition for a society appropriate for human beings. The mind does not work under compulsion. Force a man to submit or to act against his judgment, in fact it paralyzes the capacity for reason. A proper social system recognizes individual rights and bans physical force. It encourages thinking by permitting the thinking individual to receive and dispose of the fruits of his thinking. The collectivist society systemically does the precise opposite and punishes thinking. A government is an institution which holds its perfect power enforcing the rules of social conduct in a given geographical area. The two great values to be gained by social [inaudible] are knowledge and trade for these very benefits indicate the limit and define what kind of men can be of value to one another in what kind of society. Only rational productive independent men in rational productive free society [fragment]. A government is the means of placing [inaudible] control. Libertarians regard government as the greatest potential for [inaudible] individual rights. Since protection of individual rights is the only proper purpose of the government [tape cuts out]. 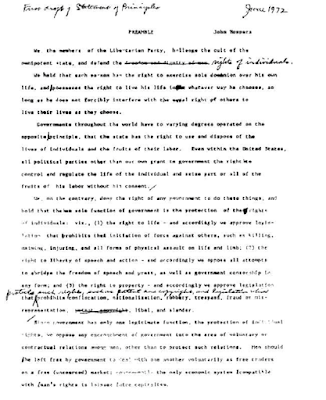 Adopted unanimously by the delegates to the first national convention of the Libertarian Party, on June 17, 1972. We, the members of the Libertarian Party, challenge the cult of the omnipotent state, and defend the rights of the individual. We hold that each individual has the right to exercise sole dominion over his own life, and has the right to live his life in whatever manner he chooses, so long as he does not forcibly interfere with the equal right of others to live their lives in whatever manner they choose. Governments throughout history have regularly operated on the opposite principle, that the State has the right to dispose of the lives of individuals and the fruits of their labor. Even within the United States, all political parties other than our own grant to government the right to regulate the life of the individual and seize the fruits of his labor without his consent. We, on the contrary, deny the right of any government to do these things, and hold that the sole function of government is the protection of the rights of each individual: namely (1) the right to life -- and accordingly we support laws prohibiting the initiation of physical force against others; (2) the right to liberty of speech and action -- and accordingly we oppose all attempts by government to abridge the freedom of speech and press, as well as government censorship in any form; and (3) the right to property -- and accordingly we oppose all government interference with private property, such as confiscation, nationalization, and eminent domain, and support laws which prohibit robbery, trespass, fraud and misrepresentation. Since government has only one legitimate function, the protection of individual rights, we oppose all interference by government in the areas of voluntary and contractual relations among individuals. Men should not be forced to sacrifice their lives and property for the benefit of others. They should be left free by government to deal with one another as free traders on a free market; and the resultant economic system, the only one compatible with the protection of man's rights, is laissez-faire capitalism. Adopted by the delegates to the second national convention of the Libertarian Party in Dallas, 1974. We hold that each all individuals has have the right to exercise sole dominion over his their own life lives, and has have the right to live in whatever manner he they chooses, so long as he they does not forcibly interfere with the equal right of others to live in whatever manner they choose. Governments throughout history have regularly operated on the opposite principle, that the State has the right to dispose of the lives of individuals and the fruits of their labor. Even within the United States, all political parties other than our own grant to government the right to regulate the life lives of the individuals and seize the fruits of his their labor without his their consent. 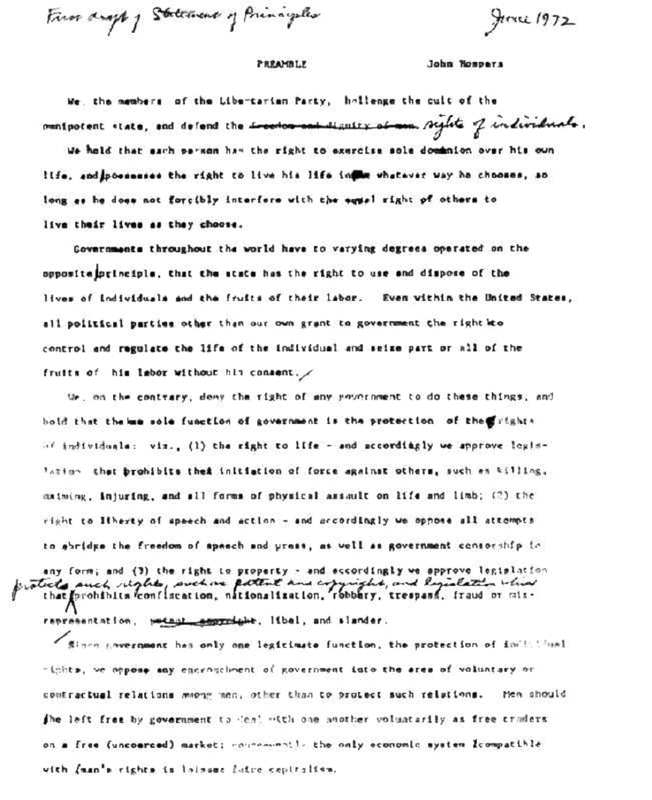 We, on the contrary, deny the right of any government to do these things, and hold that the sole function of government is the protection of where governments exist, they must not violate the rights of each any individual; namely, (1) the right to life — and accordingly we support laws prohibiting prohibition of the initiation of physical force against others; (2) the right to liberty of speech and action — and accordingly we oppose all attempts by government to abridge the freedom of speech and press, as well as government censorship in any form; and (3) the right to property — and accordingly we oppose all government interference with private property, such as confiscation, nationalization, and eminent domain, and support laws which prohibit the prohibition of robbery, trespass, fraud, and misrepresentation. Since governments has only one legitimate function, when instituted, the protection of must not violate individual rights, we oppose all interference by government in the areas of voluntary and contractual relations among individuals. Men People should not be forced to sacrifice their lives and property for the benefit of others. They should be left free by government to deal with one another as free traders on a free market; and the resultant economic system, the only one compatible with the protection of man’s individual rights, is laissez-faire capitalism the free market. (e) and the repeal of all controls on wages, prices, rents, profits, production, and interest rates. Since we believe that every man is entitled to keep the fruits of his labor, we are opposed to all government activity which consists of the forcible collection money or goods from citizens in violation of their individual rights. Specifically, we support the eventual repeal of all taxation. We support a system of voluntary fees for services rendered as a method for financing government in a free society. b.) the eventual repeal of all taxation. We oppose as involuntary servitude any legal requirements forcing employers or business owners to serve as tax collectors for federal, state. or local tax agencies. We defend the rights of individuals to engage in any religious activities which do not violate the rights of others. In order to defend religious freedom, we advocate a strict separation of church and state. We oppose govemment actions which either aid or attack any religion. We oppose taxation of church property for the same reason that we oppose all taxation. e.) support a declaration of unconditional amnesty for all those who have been convicted of, or who now stand accused of tax resistance. All persons are entitled to keep the fruits of their labor. We call for the repeal of the income tax, the abolishment of the Internal Revenue Service and all federal programs and services not required under the U.S. Constitution. These speciﬁc policies are not our goal, however. Our goal is nothing more nor less than a world set free in our lifetime, and it is to this end that we take these stands.